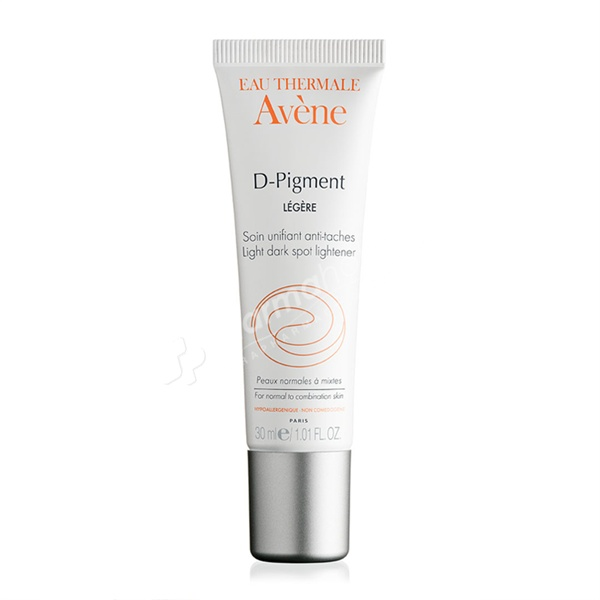 D-Pigment Light Dark Spot Lightener is a treatment for normal to combination skin which corrects localised or widespread brown spots, prevents the appearance of new brown spots and evens out the skin's complexion. Enriched with shine-reducing powders to leave skin soft and shine free. It combines 3 active ingredients: Melanyde to slow down the production of melanin (pigment), Retinaldehyde to help eliminate excess melanin in the skin and Pre-tocopheryl, a vitamin E precursor (powerful antioxidant) to protect the skin cells from free radicals. Paraben free and fragrance free. Apply in the evening to the affected areas: localized or widespread dark spots on the face, neck and hands. Water, Triethylhexanoin, Cyclomethicone, Avene Thermal Spring Water, Cetearyl Alcohol, Ceteareth 20, Polymethyl Methacrylate, Ceteareth 33, Caprylic/Capric Triglyceride, Ammonium Acryloyl Dimethyltaurate/VP Copolymer, Benzoic Acid, BHT, Disodium EDTA, Oenothera Biennis (Evening Primrose) Oil, Phenoxyethanol, Phenylethyl Resorcinol, Red 33 (CI 17200), Retinal Silica, Sodium Hydroxide, Tocopherol, Tocopheryl Glucoside.